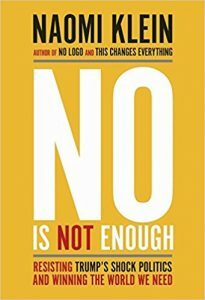 In her new book, No Is Not Enough: Resisting Trumps Shock Politics and Winning the World We Need, Klein reminds us to pay attention not only to the style in which Trump governs (a multi-ring circus so routinely corrupt and corrosive that anti-democratic practices seem normal) but in whose interests he governs (the wealthy, those he believes to be the rightful winners in the capitalist cage match), while recognizing the historical forces that make his administration possible (decades of market-fundamentalist/neoliberal rejection of the idea of a collective good). Trump is not a rupture at all, but rather the culmination—the logical end point—of a great many dangerous stories our culture has been telling for a very long time. That greed is good. That the market rules. That money is what matters in life. That white men are better than the rest. That the natural world is there for us to pillage. That the vulnerable deserve their fate and the one percent deserve their golden towers. That anything public or commonly held is sinister and not worth protecting. That we are surrounded by danger and should only look after our own. That there is no alternative to any of this (p. 257-258). There are biophysical limits that we can’t wish away because they are inconvenient, and they limit our social/political/economic options. Those realities include not only global warming but an array of phenomena, all interconnected: accelerating extinction of species and reduction of biodiversity; over-exploitation of resources (through logging, hunting, fishing) and agricultural activities (farming, livestock, timber plantations, aquaculture), including the crucial problem of soil erosion; increase in sea levels threatening coastal areas; acidification of the ocean; and amplified, less predictable threats from wildfires, floods, droughts, and heat waves. We are no longer talking about localized environmental degradation but global tipping points we may have already reached and some planetary boundaries that have been breached. The news is bad, getting worse, and getting worse faster than most scientists had predicted. We have a chance for some kind of decent human future, if we can face the challenges honestly: How do we hold on to the best of our human nature (that striving for connection) in the face of existing systems that glorify the worst (individual greed and human cruelty)? All that we dream is not possible, but something better than what we have created certainly is within our reach. We should stop fussing about hope, which seduces too many to turn away from difficult realities. Let’s embrace the joy that always exists in the possible, and also embrace the grief in what is not. This article was posted on Tuesday, June 20th, 2017 at 2:10am and is filed under Activism, Book Review, Climate Change, Donald Trump, Ecology, Environment.